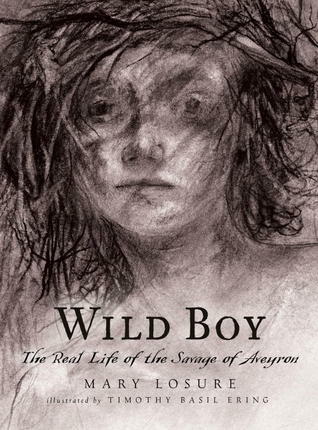 Overall: 3/5--This was a good introduction to the Wild Boy of Aveyron, but I thought it went a little too long. To make this feel more like a story, author Mary Losure speculates on lots of the information, including the word "perhaps" or speculating that "Victor had no way of knowing it, but..."
The author includes lots of information and quotations from doctors and others who studied Victor and uses that information to extrapolate on what Victor's life might have been like, both before and after his life in Paris. I really love the paragraph about how Victor Hugo, author of The Hunchback of Notre Dame, may have based the character of Quasimodo on the wild man he saw running through Madame Guerin's convent gardens. Hugo reportedly grew up a few houses down from this location. To me, there is not enough information here to justify a 176-page book. I think this would have made a great picture book for older students, with the quotations from those who studied Victor in text boxes alongside the penciled drawings included in the book. I am still not sure if Victor could really hear. Was he truly deaf? He seemed to be able to hear some things, but not others. What does this mean? He attended a deaf-mute school, but one part of the book says that he could hear. I went back to try to see if I missed something, but I could not find the answer. Presentation & layout: 2/5--Lines of text are widely spaced, which improves readability. Each chapter begins with a short quotation from a scientist or historian who studied Victor, lending authenticity to the text. Most pages do not include an illustration. Quality of information: 3/5--The author frequently speculates on what might have happened or how the Wild Boy might have felt. This is somewhat necessary as there is so much we don't know about Victor's life. There is good information here, but I think it should have been condensed. Photos/illustrations: 4/5--Contains a few full-page penciled drawings, maybe one in each chapter. The pencil drawings do show movement and action, and I think they complement the story quite nicely. I love Victor's facial expressions in the drawings--they highlight his frustration with the whole situation, which I think accurately portrays how he must have felt about being constantly watched and studied. Illustrations do not include captions. My only complaint about the illustrations is that I wish there were more of them. Documentation of sources: 5/5--A one-page bibliography, as well as several pages of Source Notes. Front and back matter: 4/5--Map on endpapers. An Afterword gives insight on what is known of Victor's adult life and death at age 40. Author's Note gives a present-day perspective into whether Victor might have been autistic and the positive and lasting changes in education based on what we learned from children like Victor. Source Notes provide details on specific quotations. Bibliography and index also included. I would have liked to see a timeline. Engrossing: 4/5--I enjoyed the story. Writing: 4/5--Easy-to-understand and well-suited to upper-elementary and middle school readers. Appeal to teens: 4/5--I think my students will be interested in this topic. Every year in October, our sixth grade English teachers do a research unit on Mysteries of the World. It includes all kinds of odd topics--from the Egyptian pyramids to UFOs to Bigfoot--and I just suggested the teacher add feral children to the list. Appropriate length: 2/5--It's not dull, but it could definitely be condensed. THE BOTTOM LINE: Recommended for middle school libraries.